Just like people, your established lawn needs a feed and a drink to remain healthy. The key is to water and feed the right way. When done properly, it’s probably less than you think. Unless you live somewhere that gets very little summer rainfall such as Perth, you can get away without a watering system. Whether you use a hose and sprinkler, or a system, big deep waterings less frequently are much better than lots of small shallow irrigating. Sure sometimes water restrictions makes that hard, but if you can water deep, the roots grow deeper, making your lawn more drought tough. 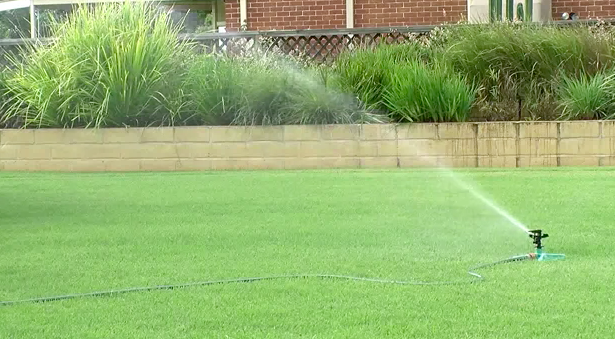 With warm season turf like Buffalo, Couch, Kikuyu and Zoysia, I usually let the lawn tell me when it’s thirsty. The leaves on the lawn will wilt slightly and that for me says water. On the east coast it usually takes 6 to 10 days without water in the heat of summer to do that. Then its time to water, but make sure it’s a deep water. This method uses far less water over a year than more frequent short watering. In fact I generally only water my lawns about 6 to 10 times per year. The rain does the rest. Did you know research proved that a one or 2 year old lawn uses more water than many drought tolerant plants, but a 4 year old lawn uses about half the water of plants. Its all about the deep watering, and deep roots. Soils often become water repelling; meaning no matter how much you irrigate the water won’t get into the soil properly. So make sure you use a wetting agent in Spring, and Summer. You can use a stand alone type, or you can try a fertilizer that comes with a wetting agent. The best product to fertilise with is a good slow release fertiliser. The only thing better is one with a wetting agent. Slow release fertilizer will not burn your lawn, and it will keep working for 2 to 3 months. A standard fertiliser can burn, and only hangs around for a few days to a week, and often is dissolved into run off water, washing down drains and polluting our storm-water. Fertilise in Early Spring, then a lower application in Summer if you desire a darker green lawn at that time of the year. Did you know the most important fertilise every year is the one in Autumn. It’s the one that gets your grass through the long winter months, and gives it enough energy to start growing again next spring.